This birds hose is made from 1 inch thick eastern white pine. It is sturdy and well made to last for years. 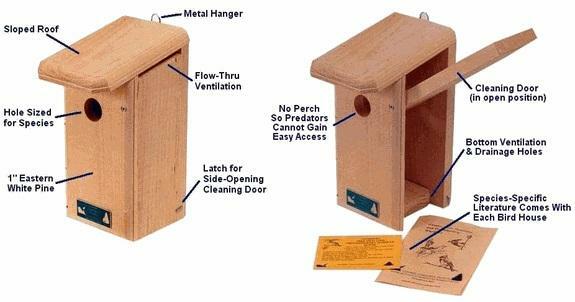 Bird house dimensions are 12-1/2"H x 6-1/4"W x 8-1/2"D.
The swallow bird house is made to attract swallows and chickadees like small birds. The difference from what bird will occupy your house is the placement. You can attract more than one type of bird with this bird house, but if you want to get swallows than you need to follow some guidelines. Swallows like open areas where they can fly and catch insects. It is best to place the swallow bird house on poles in open fields. The swallows will quickly accept nest boxes if you place them in the right place. If you place the swallow bird house next to an open field, not to close to trees or bushes you can be sure swallows will come. Don’t place it on a tree or in heavy forested area, if you do that you will attract other birds like chickadees. Swallows love to nest next to water lines but don’t place it to close. Raccoons will raid the bird house if it is close to water. Place it 100 meters from houses or bushes to prevent house sparrows and wrens to occupy the house. The good choices are metal poles or pipes, so that the bird house can last for years and stand firm. Make a steel pipe cut to 8-1/2' lengths. Then dig a hole in the ground roughly 2-1/2' deep, which leaves 6' of pole above ground for the bird house to stand. The good height from the ground is five and one-half to six feet to entrance hole .You want to make it hard for predators to climb up the pole. Don't mount bird houses any lower then this even if it means you'll need to step up on something to inspect the bird houses. If there is strong wind coming from one direction it is best to face the swallow bird house away from it. The house is easy to clean, there is an opening for drainage, and is designed with a ventilation system to prevent overheat. Cleaning the birdhouse is not needed as birds are clean by nature and will keep it spotless. It's best to have your swallow bird houses up and running when the swallows begin to return, but not absolutely necessary. Tree swallows usually return sooner than other birds in season. So the earlier you out it up sooner the swallows will occupy it. Check the price of Titmouse Warbler/Tree Swallow bird house here.